Saturday January 12th 1924 I knit quite a lot on Mrs Falks bag. I got a box of fruit started to The Masons. We all went down town late in afternoon. Letter from Roxie Rohenor. 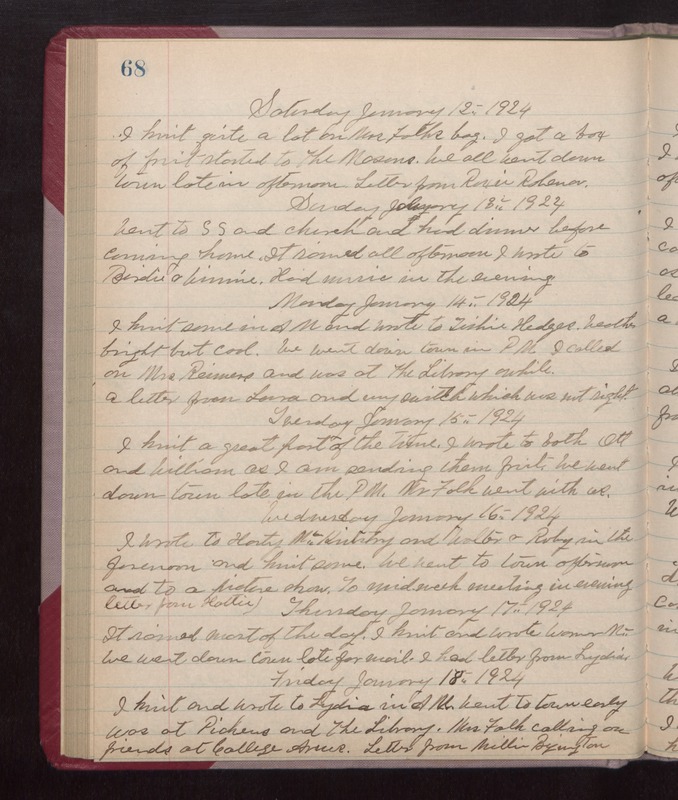 Sunday January 13th 1924 Went to S S and church and had dinner before coming home. It rained all afternoon. I wrote to Birdie & Winnie. Had music in the evening. Monday January 14th 1924 I knit some in AM and wrote to Tishie Hedges. Weather brought but cool. We went downtown in PM. I called on Mrs Reimers and was at The Library awhile. A letter from Laura and my switch which was not right. Tuesday January 16th 1924 I wrote to Harty McKinstry and Walter & Ruby in the forenoon and knit some. We went to town afternoon and to a picture show. To mid-week meeting in evening. Letter from Hattie. Thursday January 17th 1924 It rained most of the day. I knit and wrote Warner Mc--- We went down town late for mail. I had letter from Lydia. Friday January 18th 1924 I knit and wrote to Lydia in AM. Went to town early was at Pickens and The Library. Mrs Falk calling on friends at College Arms. Letter from Millie Byington.